I have been working away on the dining room. So far I have this little corner put together and the new curtains up. If you missed it last week I shared how I achieved the custom cross buck/barn door wainscoting. I love the faux linen striped panels. They are the same color story as the cabana striped ones I used in our master bedroom. If you look closely you can see that I put up lace panels in the actual windows. It is hard to get a picture where they show up. This is how the corner of our dining room looked for more than several years. This is what it looks like now. I have always wanted a large chalkboard in the dining room so I figured why not put one here. The blue buffet is a piece I had in our living room last year before I made that space over. It was between our two chairs. I was going to have to sell it because after the living room makeover I no longer had a place for it and it was killing me to think of letting it go. I am so glad that I ended up finding a spot for it in here! Of course I am still working on accessorizing the space but I figured y'all might like to see where I am at. Before I go I wanted to share the peonies Mr. FrontPorch bought for me. 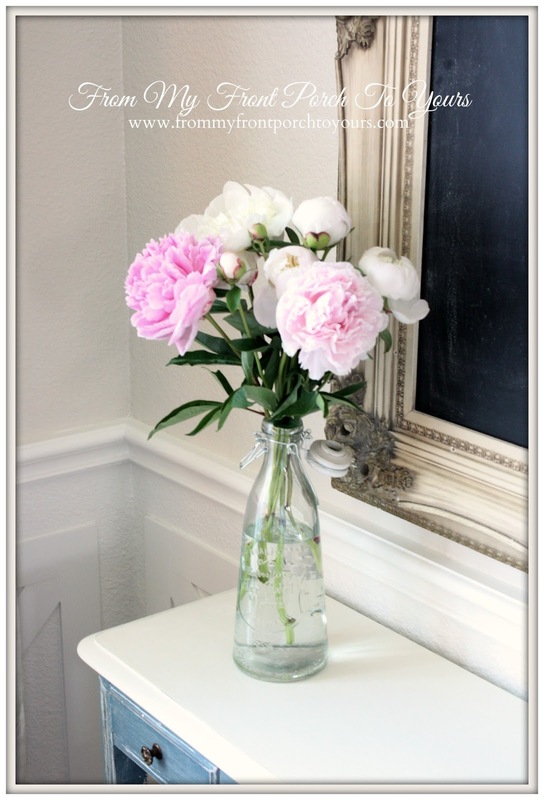 I have long loved Peonies and have never had any. He has always wanted to buy me some for Valentines Day but I am too practical and tell him not to spend the crazy amount of $$ on them. When we stumbled upon these at the grocery store for just $6.99 a bunch he bought me both colors. They are so beautiful and smell wonderful. I could not believe how fast the buds blossomed open after I put them in water. 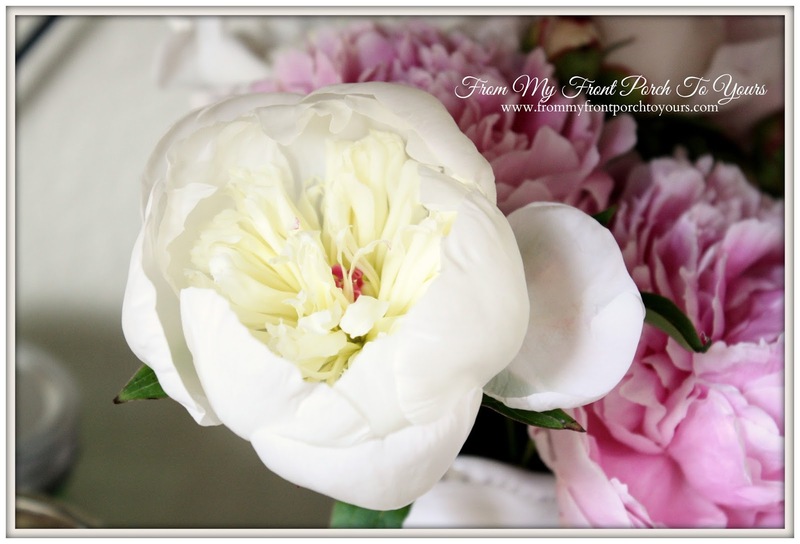 Peonies are truly a beautiful flower! I love all of the new things you have done, beautiful! 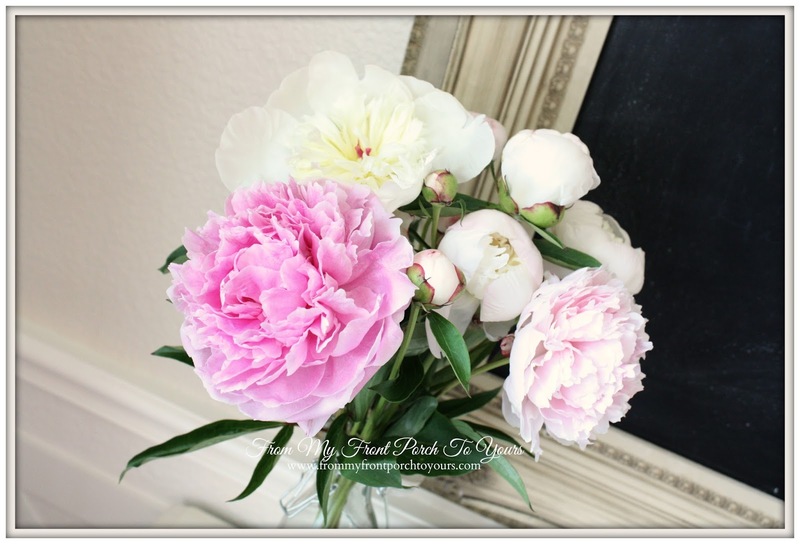 Looking good Pamela--i love peonies too and just bought some this morning! The peonies are gorgeous and the corner is awesome. Great job. 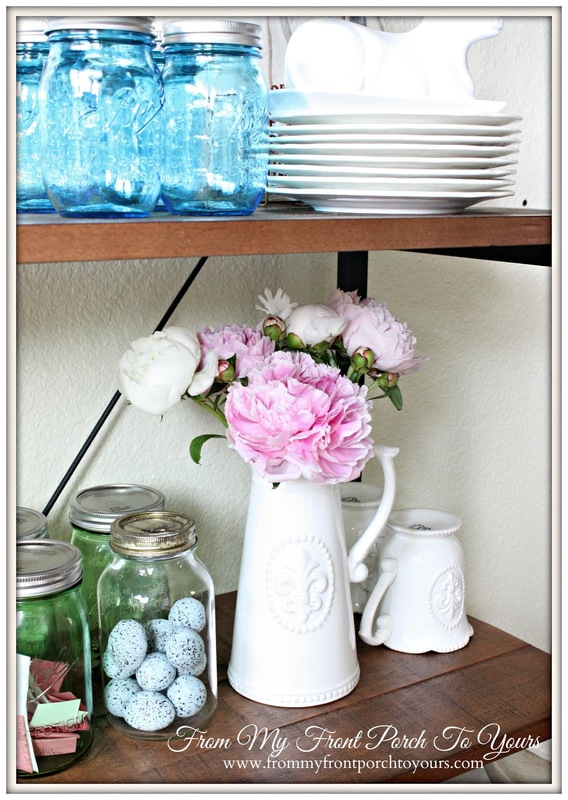 I love your newly decorated space and the peonies are beautiful! 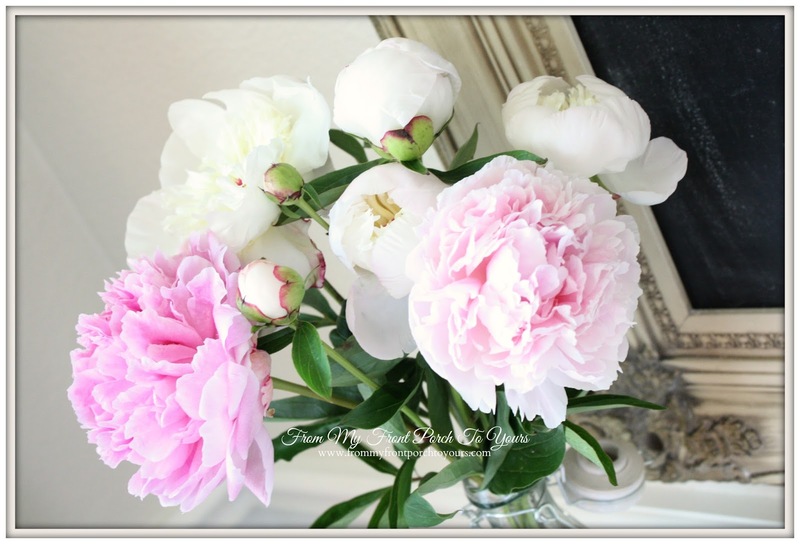 Your peonies are gorgeous, Pamela! I just let out a sigh seeing them. : ) I love that buffet/console piece. I'm so glad to hear you found a place for it here in your dining room. I would hate to have to let that go if it was me! Love the new curtains, but you know I loved the drapes you had in here previously, too. 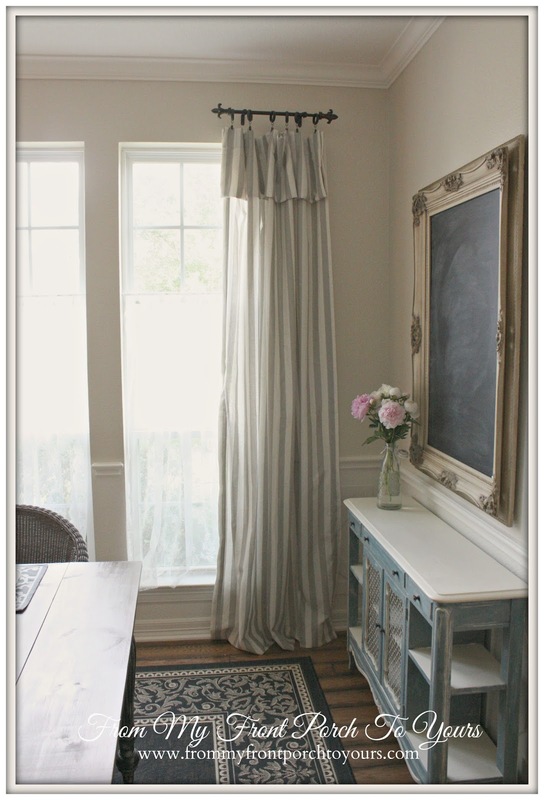 The light colored curtains and stripes are a nice look for summer, too. Enjoy your blooms and have fun out at that pool this Summer! Very pretty, Pamela! The new curtains look wonderful. 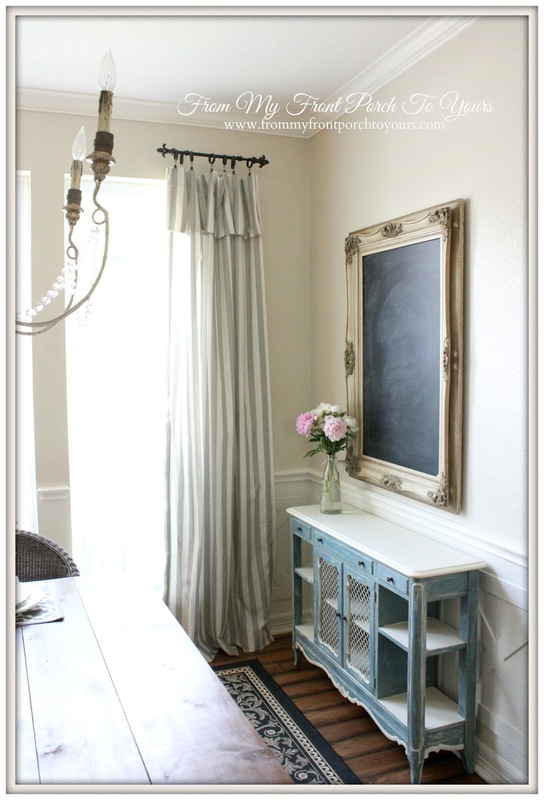 Love it all Pamela...the new curtains, the corner with the buffet and chalkboard, and the gorgeous peonies!! !...You have been a busy girl!!! It's all looking gorgeous Pamela! 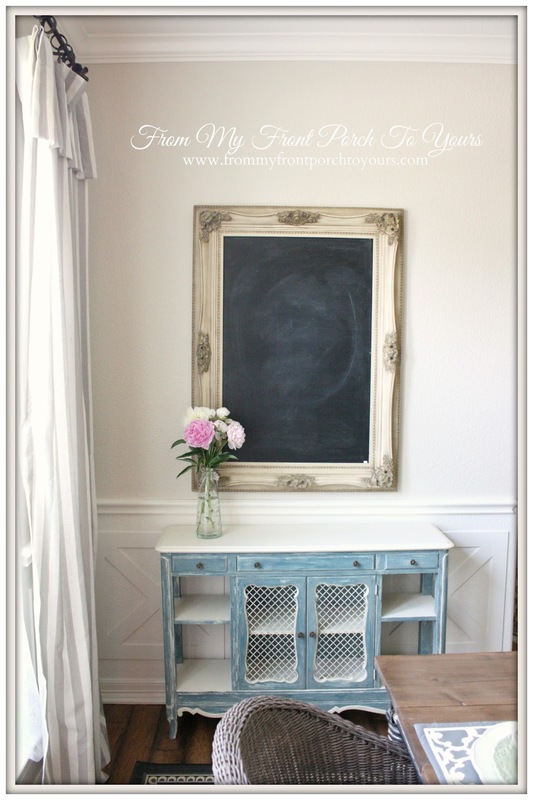 Love the chalkboard, I have one in my diningroom but it is much smaller. Your curtains and flowers are beautiful. The curtains look fabulous in your dining room. LOVE them on the hardware. Peonies are my favorite too! Pamela, you dining room is so pretty! The drapes are gorgeous and add so much to this area. You just amaze me with your creativity! You have an eye for design! I love your style! Peonies are worth every penny. You must try to grow your own! I planted a shrub at our first house, and it took at least two years for it to finally bloom. But when it did. . . Gorgeous! Even now, more than 10 years after we moved, a former neighbor will tell me, "Your peony is beautiful this year." I'm planning to plant a shrub at our new house! Beautiful Pamela! i am with you...i really love peonies too. Your looks so summery and soft. 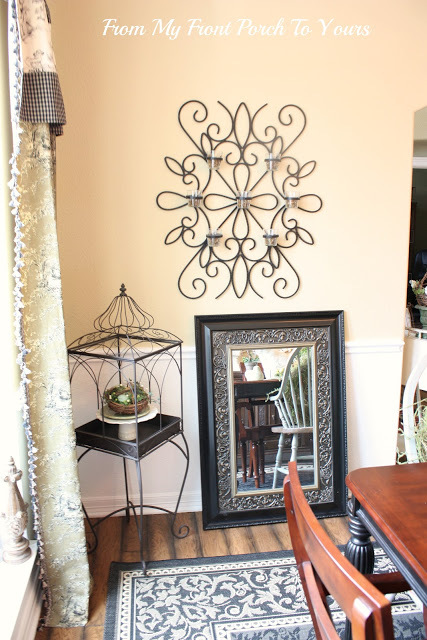 What a beautiful accent to the lovely corner in your dining room. Love what you're doing in your dining room, Pamela! Your wainscoting is awesome! I'm loving the changes you're making to your dining room! It's softer now. The large chalkboard is such a great addition too. Wish I could find beautiful fresh peonies around here for that price. I love peonies, but I have fakes in my house.